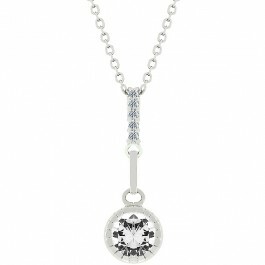 Hanging Bliss is fashioned with a sparkling round clear CZ hanging on a blissful bail of smaller clear CZ in a perfect silver tone. Peaceful, subtle, and stunningly beautiful. White Gold Rhodium Bond is achieved using an electroplating process that coats the item with heavy layers of rhodium, a close cousin of platinum that costs three times as much, which gives our jewelry a platinum luster.